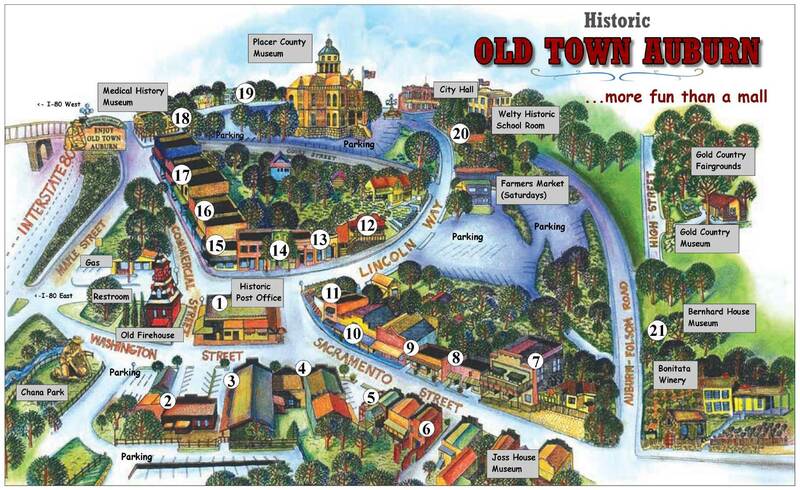 Established in 1849, historic Old Town Auburn, is 32 miles northeast of Sacramento where I-80 and Hwy 49 meet. Originally where gold was first discovered in Placer County, today it’s the location for special events all year 'round, including a weekly Farmers market, antique street fairs, Cinco de Mayo celebration, a fall wine and food festival, four art walks, and a two-weekend old-time Country Christmas. Try one of our 15 restaurants, 40 quaint shops and services. Don't miss the Old Town Art Gallery featuring the works of 60 local artists. Four museums can be found within a few blocks, Old Town Auburn... a great place to relax and enjoy a slice of Old California's pleasures and treasures. View the full Walking Tour Map.